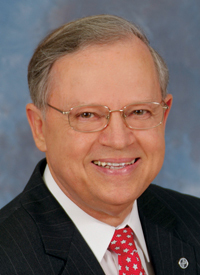 "Trust: The Firm Foundation for Kingdom Fruitfulness"
Dan Busby is the president of ECFA, an organization that accredits Christ-centered ministries in the areas of governance, financial management and stewardship/fundraising. ECFA’s seal enhances trust of givers, which increases generosity, providing greater resources to help fulfill the Great Commission. ECFA accredits nearly 2,000 churches and nonprofits. These organizations have annual revenue in excess of $25 billion. Dan has over 40 years of experience serving the Christ-centered church and nonprofit community and frequently speaks nationally on related issues. He is a prolific writer with 54 volumes of five book titles published including a 2015 release, TRUST: The Firm Foundation for Kingdom Fruitfulness. Dan received a masters of business administration degree from Emporia State University, Emporia Kansas. The University also named him as a Distinguished Alumnus in 2014.